the sun had only just begun to warm to earth up on these Derbyshire moors. Its a favorite visiting haunt of mine because as kids we’d come for the day, normally a bleak overcast sunday and be let loose climbing these huge mini mountains, in those days we’d not make the top but nowadays I can cheat and simply drive up through the pass and park around the back, so its just a short hike. We’d scramble into pot holes and find loads of Blue John, which is a semi precious blue/purple quartz stone, much loved by the occupying Romans 2000 years ago, its almost all spent now, and you’d be very lucky to find scraps of it on the hillside like we did. You can still buy large victorian decorative blue john carved urns for a small fortune in the picturesque Castleton antique shops at the bottom of the pass, again I always found it bleak and it still smells of the same sulfurous domestic coal smoke even in mid summer when i visited as its at such a high altitude. Back to processing, I shot this in the early evening, and in the original capture the sky is almost blown out, so I opened it in raw and saved a bright version, then i repeated it but this time I darkened the 2nd copy to bring out the cloud details. In Photoshop I simply cleared off the darkened landscape after stacking and merged the darker sky on top of the lighter landscape to balance. Naturally you can now do this all in Camera Raw, but I guess Im still Photoshop old-school! I then played with Russell Brown’s Adobe Paper texture panel loaded with several alternating Fly packs, thanks to my new Imac its a pleasure to load each full size pack one after the other, you guys that don’t have new computers will be in for a treat when you upgrade! I ended up with just one texture – Nuriel Clouds to brighten the center and the classic Stygian Tin texture, to add a nice vignette and atmosphere, this time no Nik was used at all, just good old-school Flypaper textures! Note from the base image Ive cleared away the messy sheep wool piles from the bottom left, its always a toughie as to wether or not to clean-up images, but I always vear towards illustration where cleaned-up images are needed. This entry was posted on Wednesday, October 23rd, 2013 at 10:12 am. 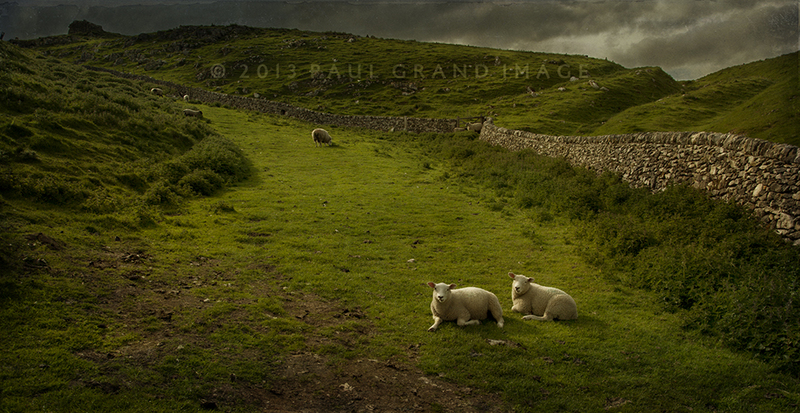 It is filed under Blog and tagged with Castleton, lambs, landscape, Paul Grand, peak district, sheep, Summer painterly, Summer Painterly Pack, UK. You can follow any responses to this entry through the RSS 2.0 feed.